Quaranic names are mostly preferred by devout Muslims for their children. Also names drawn from Arabic, Persian, Turkish and Urdu languages are quite common in India. The naming ceremony is held on the seventh day of the child’s birth with parents selecting a name with Islamic connation and positive meaning. Moreover, the Aquiqa – a ritual involving the slaughter of sheep – is also performed on the seventh day. The meet is then distributed to the relatives and given to the poor. If the family does not have money, then they can arrange to distribute the meat at a later stage. 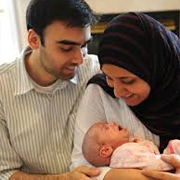 Muslim couples do fall in line with customs and religious edicts during the naming of their newborns and with the blessings of elders in the family, the parents anoint their child with the name that is chosen after much deliberation. Families use clan or sub-group names as suffix to the main name of the child. Usually boys have a personal name which is either preceded or followed by a religious title. According to Quran, the choice of a good name is a fundamental right to every Muslim child and it should inspire self-respect and encourage the child to progress in life with determination. Hence, parents consult elders and deliberate much before naming their child in a simple ceremony. Boys may have a personal name, which is either preceded or followed by a religious title. Taweez, a black piece of string with a small pouch containing a prayer, is tied around the baby’s wrist or neck to protect it from ill-health and hence this religious string is given due respect in Indian Muslim families. Muslims across the states in the country rely on Holy Quran to give their newborn a suitable name and then precede that name with either a clan name or follow it with surname of the family.